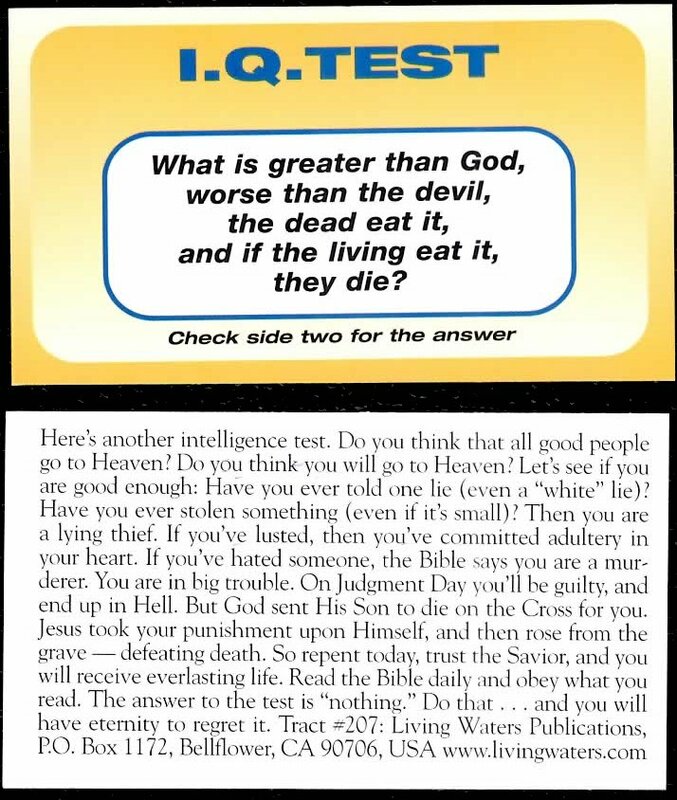 This tract has a riddle on the front and a gospel presentation on the back. 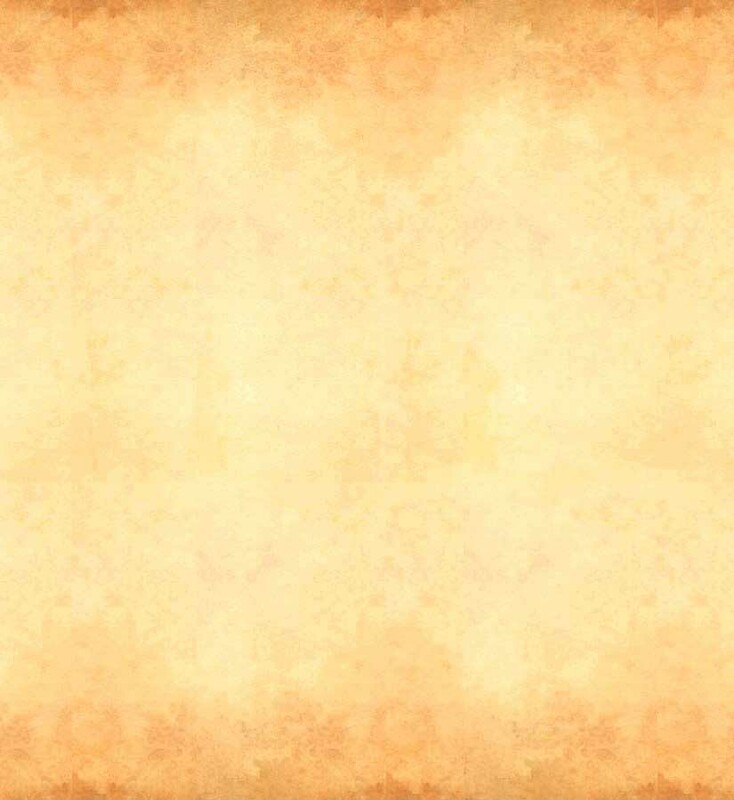 We also have a banner with the riddle on it. Both the bannber and the tract are used as "ice breakers" to start a conversation. This is not a good "take away" tract. It is best used for starting conversations with people who have somewhat of a CHristian background. and if the living eat it, they die? Most people look at it, and look at it, and look at it... After a short time offer to give them a hint. 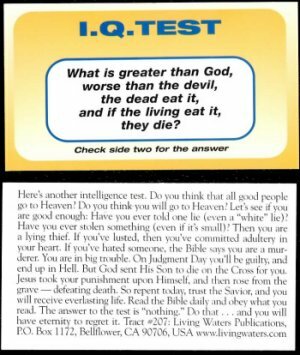 The hint is, "Concentrate on answering just the first question, what is greater than God?" Have you got the answer? Nothing is greater than God. By putting our focus on God getting the answer to this seemingly impossible question becomes easy. That is one of the ways this tract can be used. Have you ever taken something that does not belong to you? These are just three of the Ten Commandments, and you have admitted you are a... (continue with the good person test). Another approach is to follow the gospel presentation on the back ofthe tract. After they get the answer to the riddle, or after you give them the answer, say, "Here's another question. Do you think all good people go to heaven?" What if the person dsays they are an athiest? An atheist does not believe in God, so you'd expect they'll never be able to come up with "nothing" as the answer. But, you'll be surprised at home many of them get the right answer. 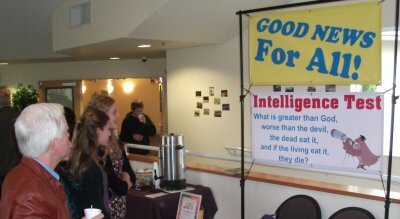 However, if an atheist can't think of the answer (or in some cases it may be they are refusing to say the answer), then go to the third part of the question and have them focus on that: "What do dead people eat?" Nothing. Then point out that that as a Christian we recognize that there is nothing greater than God. And that God has answered the major questions most people have, such as, "what happens after we die?" Then ask if they know how Christianity answers this question. After listening to their answer, use the good person test to explain what Christians really believe, and in the process present the gospel.